Hellooo everyone! I have found something I cannot use a commercial pattern for, so am back to a bit of pattern cutting, even though it is not something modern. I found this image on Pinterest originally, which then lead me to the New York Public Library Digital Gallery. 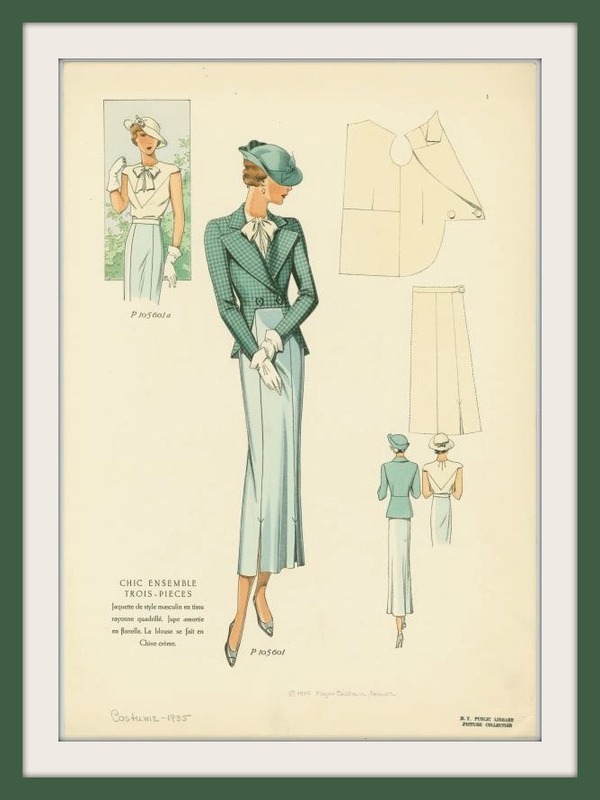 They have, quite literally, millions of images of the most amazing fashion sketches! This jacket is beautiful! The wide revers, short front waist & scoop tails at the back are just begging to be made up! I have sort-of decided to get this made up for Daughter No2 for Christmas. I will have to see how I manage the fittings so she doesn’t realise what I’m up to, but I really would like to give it a go. I have a black & grey wool check that would work well, especially if I use a good, rich contrast colour for the lining. Bound buttonholes on this garment will be a must, I think! So I’d best be off then, still have three unfinished projects on my sewing table from vintage commercial patterns in my other venture…. I agree. Divine jacket. If you adopt me, can you make me one too? Gorgeous! Your daughter will look amazing in that jacket. Thanks! I have to say I’m tempted to make myself one too! What a beautiful jacket! Thank you for posting the NY Public Library link. I had no idea they had images of this kind! Can’t wait to see your daughter’s finished jacket…. Thanks Amanda, I hope the finished article will live up to expectations! Oh goodness, I want the hat! I bought a book on millinery recently, but I just started grad school and haven’t had time to try anything like that. It is gorgeous! Can’t have an outfit like that without the proper hat! I have a friend who is a fabulous milliner: http://www.louisepocock.com/ She may be persuaded to make you one… Good luck with grad school! That is an amazing jacket design. I’ve recently drafted a jacket block and this will be a variation when I perfect it. Oh my. You are so very skilled.